StorageCrypt Ransomware is the last malware in order of time exploiting the SambaCry vulnerability, it was developed to target NAS Devices. Experts discovered a new strain of malware exploiting the SambaCry vulnerability (CVE-2017-7494), it has been called StorageCrypt Ransomware because it targets NAS Devices via SambaCry Exploit. 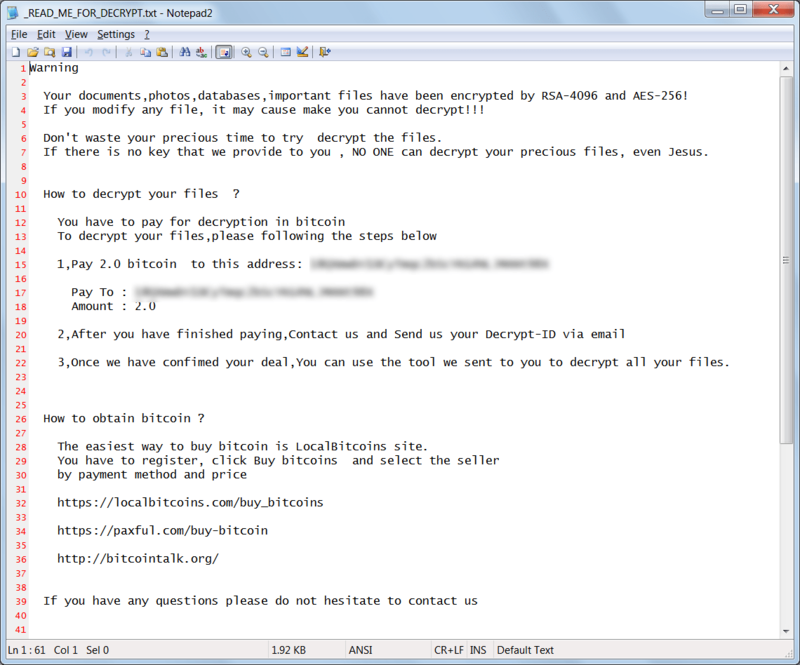 The StorageCrypt ransomware demands between 0.4 and 2 Bitcoins ($5,000 to $25,000) for decrypting the encrypted files. “Recently BleepingComputer has received a flurry of support requests for a new ransomware being named StorageCrypt that is targeting NAS devices such as the Western Digital My Cloud.” wrote the malware expert Lawrence Abrams from BleepingComputer. Experts discovered that the malware exploits the Linux Samba vulnerability, aka SambaCry, that was patched in May. The vulnerability could be exploited by remote attackers to execute arbitrary code on targeted systems by uploading a shared library to a writable share, and then causing the server to load that library. In July, experts discovered a malware dubbed SHELLBIND that exploited the CVE-2017-7494 Samba vulnerability in attacks against Internet of Things devices. SHELLBIND infected most network-attached storage (NAS) appliances, it exploits the Samba vulnerability (also known as SambaCry and EternalRed) to upload a shared library to a writable share, and then cause the server to load that library. CVE-2017-7494 is a seven-year-old remote code execution vulnerability that affects all versions of the Samba software since 3.5.0. The flaw has been patched by the development team of the project. configure shared files to have write privileges. The Samba vulnerability affects the products of several major vendors, including NAS appliances. The Samba bug appears to be a network wormable issue that could be exploited by a malicious code to self-replicate from vulnerable machine to vulnerable machine without requiring user interaction. In June, researchers at Kaspersky Lab set up honeypots to detect SambaCry attacks in the wild. The experts spotted a malware campaign that was exploiting the SambaCry vulnerability to infect Linux systems and install a cryptocurrency miner. According to Lawrence Abrams, the StorageCrypt Ransomware relies on the exploit executing a command to download a file called sambacry, store it in the /tmp folder as apaceha, and then executing it. It is still unclear if the executable only installs the StorageCrypt ransomware or if it is also used as a backdoor. Once the ransomware infected a device, it encrypts the files and renames them by appending the .locked extension to them. “When a file is encrypted it will be renamed so that the .locked extension is appended to the filename. The ransomware will also drop a ransom note named _READ_ME_FOR_DECRYPT.txt that contains the ransom amount, the bitcoin address to send payment to, and the email address JeanRenoAParis@protonmail.com to contact after payment.” continues Abrams. The ransomware drops two files on the infected NAS devices, namely Autorun.inf and 美女与野兽.exe, the latter file is meant to spread the Windows executable to the machines the folders on the NAS device are accessed from. To avoid being infected by the StorageCrypt ransomware or other malware exploiting the SambaCry flaw, users need to apply the latest. Users also need to disconnect NAS devices from the Internet, set up a firewall to protect the storage device and use a VPN for secure access to it.